Followup on the MLB100 GPS interference issue... I added an external GPS antenna to the Aera so I could 'sniff' for interference around the panel. There is a circle of 12 inch radius around the MLB100 where the GPS signal goes to zero and a slightly larger circle where the signal is degraded. Pulling the MLB100 breaker stops the GPS blanking effect. I'm wondering if there is a GPS chip on board the MLB100 and by chance does the Avidyne software turn on that GPS? The case seems to have two BNC connectors and one appears to be capped... I wonder if there's a signal coming from that capped port? While things are as they are, my wire free panel will unfortunately have at least one visible wire, to the deck top remote antenna to keep that thing working. I have just had my MLB-100 connected to the IFD-540 with 10.1.1 and 4.09 (MLB-100) software updates. Initial flight has ghosting right under the aircraft which keeps the Aux button yellow since this other(ghost) aircraft is so close. I see the same thing on my IPAD with Foreflight. Is anyone else having a similar ghosting situation and is there a way to get rid of the ghost aircraft. I have seen this on just one flight since my MLB 100 was installed. It lasted the entire flight but was gone on the next flight. I used to occasionally see this on my old TIS traffic when turning but it would only last a few seconds then. Any word on timing for the 200? The MLB100 gets its GPS position from the IFD. So if there is a GPS chip inside, it stands to reason that Avidyne software would be turning it off, not on. Bottom line: This theory has a lot of IF upon IF. While the MLB100 may indeed be the source of your symptoms, I don't think it's for the reason or method that you postulate. I am thrilled to report that I met Petersk at the Sun 'n Fun airshow in Florida. He said they replaced his MLB100 with another unit and the problem vanished. So there is no inherent design flaw with the product, there was simply some defect in his specific unit. My guess is that one of the RF shields on the circuit board was not tight or not on straight. Probably an easy thing to fix if we had access to the insides of these things. According to petersk's post on Mar 29, the issue arose immediately upon installation of the MLB100, which suggests that the problem existed when unit left the factory. When my new IFD440 arrived, it needed to be returned even before installation because the lower left knob did not work. This is perhaps a long stretch statement from just 2 units that wouldn't pass QC on arrival at the customer, but I wonder how many other issues are related to QC. I suppose that Avidyne tracks this, but perhaps it is an area for them to take a look as for possible improvement? QC issues with new units leaving the factory are expensive all around, but especially for Avidyne due to unrecoverable RMA handling and shipping costs, not to mention image and installer/customer impact (costs, delays) of a faulty new unit from the factory. I see what you're saying, but I don't know if your theory has much in the way of legs to stand on. For one thing, the MLB units are manufactured in a completely different facility than the IFD units. And the fault in Petersk's unit could have been damage unduced in shipping due to harsh handling. We will never know. In any case, I can't say that two points of data are a trend. My IFD and my MLB arrived in flawless condition. Did you really meet me, David? If so I'm glad you were thrilled! However, you are incorrect in your understanding that my MLB100 was replaced. My receiver was not replaced, I solved the GPS interference problem by using an external GPS antenna on my Aera. I would not expect a new MLB100 to resolve the issue. My understanding remains that the MLB100 wiring transmits a GPS interference signal which will blank out any nearby GPS unless you shield the wiring and perhaps trap the RF signal with a ferrite core of some sort. I have not tried that solution... my wires are bundled up pretty tightly so I'm still using the remote antenna, but that's the theory. I would expect this to be an issue with any MLB100 until they choose to add some internal shielding. I have been anxiously awaiting the arrival of the 10.2 update like everyone else. Unfortunately we found out the the initial wiring diagram for the MLB100 was incorrect. Avidyne did pay to rewire it while I was having 10.1.2 installed. Now that 10.2 is out, I am trying to schedule installation for it and the SkyTrax100. Will all of the data from the SkyTrax100 be displayed on the IFD? Can I get that same data on my Aspen PFD? Once my flight plan or approach is loaded in the IFD, I rarely look at the IFD. Course guidance and a map underlay are available on the Aspen. Will there be aural traffic alerts derived from the SkyTrax100 on the IFD? If so, do I need any additional wiring from any of the equipment to the audio panel? Initially I was missing a connection from the IFD to the audio panel for the 500 foot call out. Works now. Spending my kid's inheritance, one upgrade at a time. Thanks for this post. I look forward to hearing the answer to some of these questions. We had the MLB100 (now SkyTrax100) prewired back in 2015 before the unit was available for install similar to you. I am finally getting it installed this week, and may encounter a similar problem with the wiring. Found out today that there has to be a converter inline between either the IFD or SkyTrax and the Aspen. Still don't know if Aspen will want a ransom to allow the ADS-B data to display on the Aspen EFIS. Hope not. They also said that Aspen is still charging $2K for the AOA update to the EFIS. I understand that Aspen needs to recoup it's development costs and make a profit, but come on, two grand for a software update that they don't even have to physically do? That's just absurd. If it was $400, I would jump on it and maybe a lot of other pilots too, but $2K, ridiculous, not going to happen. I love the Aspen EFIS and the way it works. Fabulous with the IFD540 and the STec30 as a single pilot platform, but Aspen needs to rethink their unlock fee program. Totally out of line. It is definitely affecting my desire for additional Aspen displays. Not definitive. The below is my experience. Aspen told me that the ADS-B unlock for the MFD would be $795. BUT - I don't know if you already have the the "hazard unlock". I did for active traffic. The hook is that nobody can tell you that the MLB100 wx will play on the Aspen MFD. I have heard it was tried and DOES NOT, Capstone or no Capstone. Nothing official on this, mind you. One of Aspen's service engineers told me officially, the following devices play ADS-B on the Aspen MFD, x, y, z, but no Avidyne product. I have active traffic playing on the PFD and MFD, I do believe the "hazard unlock" which IIRC was also $795 covered this, but active traffic may be different than ADS-B or TIS-B. I'd really like to have wx on the MFD, I have lobbied both Avidyne and Aspen in this regard, and there doesn't seem to be any movement or interest in this. EDIT: I have AOA in the form of the Alphasystems Eagle product; it has sensor and converter box, and at the end of the project I probably had ~$2700 in it, just for price reference. In that case, I 'm not sure how much use I'll get out of installing the SkyTrax100. The IFD is center stack mounted and I fly mainly off of the Aspen. I have two iPads running Foreflight along with a Stratus2. I can already look to my iPad for Wx and traffic, why do I want to have to look to the center stack to see the same. The only advantage seems to be that when the IFD100 comes out, I will be able to see Wx and traffic there. I use my iPad mostly for approach plates when in the terminal environment. My wife has her own iPad and looks for traffic and Wx. Don't know where I would fit another tablet although I do have a third one, a mini for backup. I have RAM ball mounts in all four corners of my panel. In the pic below, the left iPad is a mini but has since been replaced with a iPad Pro 9.7". The 9.7" iPads are mounted to the top ones with long arms. I could possibly mount the mini on the bottom mount with a short arm. That should position the mini immediately to the left of the Aspen. Sounds like an interesting experiment. The plus, though, is that with an MLB you will see traffic and wx on the IFD; the value I see in this though is being able to look ahead at METARS for whevever you are going. I haven't seen how it looks on 10.2, but on 10.1.x, the representation is nice for both, and I understand it is better with more products being displayed with 10.2. EDIT: No diss intended, really, I just personally like the noncluttered approach. BWTHDIK? We'll see how it works out. My bird is supposed to go under the knife next week. For what it's worth, I already see METARS on Foreflight. Here we go again. I delivered the plane to the shop to have the SkyTrax100 and 10.2 update installed. In a previous post I told how we had the airplane pre-wired for the SkyTrax100 only to find out that the diagram supplied by Avidyne was wrong. Avidyne actually paid to have it rewired. The shop that I'm using just underwent a hostile takeover by another FBO and the avionics techs quit and went somewhere else. When the new tech attempted to install the SkyTrax100, he found that the job that Avidyne had paid to have redone, didn't finish the job. None of the wires in the back where the tray goes on the equipment rack were labeled. There was no mounting tray there at all, just coiled up wires. In the front behind the panel, only about half of the pin-outs were properly installed so that almost the entire panel had to come out to find the wires and terminate them. I was told by the original installer that my old DME antenna was the same type as for the ADS-B and would be usable, but now I find out that not only do they have to replace the antenna, but also the antenna cable. I could not test any of this out before now because I just now am having the SkyTrax installed. I have no recourse as far as I know because the FBO changed hands and the techs that actually did the work moved on to other jobs. I have made note of where they went so that they will never touch my airplane again. Avidyne and I both paid good money to have the job done correctly and now I have to pay for it again. Not happy at all. My only good thing about this is that I can tell people about what happened and make sure that people have my opinion and experiences about them. I am in a position in my area where a lot of people communicate with me to get my opinion on IFR equipment and the people to do the work. I put a lot of effort into learning all I could about what I wanted in a panel and I don't mind sharing. I spent a lot of time reading specs, talking to technicians, talking to other pilots, watching YouTube videos, and even using the simulators. 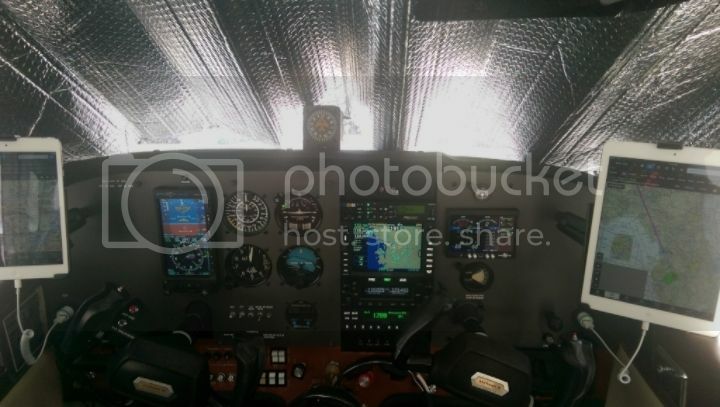 As far as Avidyne was concerned, I spent a lot of time comparing the IFD540 to the GTN750, and in the end, for me, I felt that it was more user friendly, had better support, and came in at a lower price point. I couldn't be happier with my selection in equipment. Not so much with techs. Avidyne, if you are listening, if a certain avionics shop calls you to become an authorized dealer for you and they happen to be at a southern Indiana airport, do yourself and us a favor and just say no. That's where the people that screwed me over went to. Besides, you already have one dealer on the field already. I hear your frustration, and I sympathize. It _seems_ like this falls into 2 categories: shops that care about longitudnal relationships, and shops that don't. It also appears to me that at least larger shops are having trouble keeping stable staffs of technicians, i.e., it appears that the tech who did your work 8 months ago, and whose work you liked, is no longer to be found. The last work I had done at a major shop in the PHX area was very poorly done, large scratches on a new panel, scratch on a new display unit, a handful of tools in the cockpit, sockets in the bottom of the engine compartment, etc. Asked shop manager about this, he rolls his eyes, "he's no longer with us". My question about how long they had observed his work before turning him loose on my Bonanza - no response. I am having an issue with a shop in PHX which is well chronicled in another thread and won't repeat here. My plan is to go look for a small shop of the owner-operator type and see if there can't be some stability with someone who knows my airplane. .....at least that is a goal. Beyond the purchase of the SkyTrax100, what are the appx. labor hours to install, and are there any other costs like an installation kit? I have an IFD540 and APX340 already. It will depend on where the unit is mounted and the amount of wire that have to run to the radio stack and how much do they have to take apart to run the wire? Ours in a Piper Lance, the unit sits behind the baggage area, they had to build a shelf to mount it and run wire then all the way up to the radio stack. But we had it prewired when we were installing everything else, including a new ELT that uses the GPS signal from the 540 so it was all apart, it was nothing to run an extra wire or two. So kind of hard to break down exactly what the MLB by itself would have cost to install. You can get the dimensions, its about half the size of a transponder. Mine fit above my glove compartment on the co-pilot side so very short cable runs. But if you need to install it in the rear that could be more costly. The problem is, that little guy needs to know a lot of information. It needs pressure altitude so it can compare your altitude to a mode C target, and it needs ADS-B GPS altitude/position so it can compare your GPS altitude/position to an ADSB target. It also needs a RS232 data connection to the IFD540. Prior to 10.2 it needed ARINC429 connection to the 540 for traffic, but now that comes across on the RS232 connection. You'll have to find out from Avidyne if you should wire up the 429 ports anyway for future use. It also needs an external antennae similar or same as a transponder antennae, but you can also reuse an old DME antennae which is what I did. Another reason to get it to fit up front. Anyway, not complicated but it wires up to both the 540 and 340 and that takes some labor. Gulf Coast Avionics in LAL did the initial install. They did beautiful work. They cut and powder coat the panels in house. They quoted me six weeks for the work and actually took eight weeks to complete. To be fair, I kept adding stuff while they had it. That got expensive in a hurry. You are correct though, I called back there last week to find some paperwork and the two main people that I dealt with are gone. Fortunately they keep good records. In contrast to that there is a local avionics guy at my airport that has had a Baron panel overhaul that's not any more extensive than mine and he has been working on it since September. We are almost into May now. I would be a bit peeved if it were mine. In my case they said the old DME antenna would work for the Skytrax100 but when they pulled it off, the numbers didn't match what the manual said would work. Another $85 for a short little stubby antenna. If you still have one of the old ELTs, now would be a great time to replace it with one of the new 406mhz ones. The install was minimal since they already had everything apart and had to run cables to the IFD for other things already. I have a SkyTrax100 and AXP322 both talking to an IFD540. The install was all just completed a few weeks ago and came out of the shop with the IFD540 running 10.2. I've flown about 20 hours since and am still working out the bugs. But one issue I'm having is No weather showing up on the IFD540 and Traffic is very intermittent. I keep getting an Alert about the DataLink failed or disconnected. I'll have to get the text of the Alert. I also get an Alert about ADS-B error of some sort. I guess I'm wondering if anyone else is having these type of issues. And one final question, will the SkyTrax100 feed Traffic and/or Weather to ForeFlight on the iPad? The iPad connects to the IFD540 just fine and I can move flight plans both directions. Specifics to the errors will help. A call to Tech support will probably be most productive. It is up to foreflight to use the ADSB data. The system gives a "Datalink Data Not Received" message when individual pieces of data have expired without fresh data being received to replace it. This is "the dreaded DDNR" message. This happens when you are flying on the edge of ADS-B coverage or you are out of coverage. I often see it on the ground at big airports like KDAL because I'm not in contact with a ground station until I get airborne, and it is not unusual to have a long wait to take off. But you can get the same thing by flying at lower levels in rural areas. You can go to the Datalink screen in the AUX pages and see which pieces of data have been downloaded, and how old each one is. A flight leg of more than 15 minutes above about 7000 feet should get every piece of data possible. Not that you need to fly like that every time, but it would be a good test flight to eliminate network problems from aircraft problems in your troubleshooting. Did avidyne shelf the MLX 200 idea ??? Just gonna bump this question. My understanding was that it was foreflight's interface that prevented it from importing and displaying traffic / weather from the skytrax. I too, am annoyed that I have brand new ADS-B in/out and foreflight can't/won't display it. For now I still have the stratus 2 in the plane simply to drive traffic and weather on foreflight. The fact that foreflight can get it's position source from the IFD does me little good if it won't display that ADS-B info. Put in a request ticket to FF, they are pretty responsive generally. Apparently the data is there, they just have to make use it.